If you’re unfamiliar with the term “OSINT” (open-source intelligence) it boils down to finding information that’s publicly and freely available about you, your company or anything else. How can this help you? OSINT covers a very broad array of sources and uses, and one way it can be used is to help verify your external network surfaces, and if user emails have been found in datadumps from compromised sites. In this episode of the MSI podcast, we discuss recent issues involving AWS misconfigurations that led to incidents, common problems, the importance of proper configurations to avoid these issues and how we can help you identify them in your environment. Do You Have Production Data in your Test Environment? We’ve talked about development servers, and the perils of internet facing development environments. Now, let’s talk about what is IN your development environment. Another issue we run into fairly often with dev environments,…they are set up to use production data, and sometimes this data is piped in directly at night with no modification. This introduces a risk of not only exposing this data through vulnerabilities within the development environment but could allow a contractor or unauthorized employee to view sensitive information. When was the last time you did a dumpster dive or wardial against your organization? You know these old school tactics still work, right? Yeah…. Which got me thinking about this. I couldn’t remember the last time an organization actually asked us about it beyond reviewing policies. I know this problem didn’t disappear, even as we move more and more away from paper. Paper still gets used, people write stuff down, things get printed, and no solution completely ensures that that paper doesn’t end up in the wrong bin. I know from doing it. I found something useful in almost every engagement that we’ve done in the past, whether it was an administrative password, or contact information that I can use for phishing. Recently, some researchers performed a trash inspection of some hospitals in Toronto. What they found didn’t surprise me. They found PII and PHI, a good bit of it. A resident in Palolo Hawaii found these too. A nuclear security complex was found to be dumping trash that had classified documents in it. None of these were reported breaches, just there for the taking. Who knows if anyone malicious found them too? Let’s keep working on the most prevalent topics of the day, such as phishing defense and training, but we can’t forget all of the things that were an issue in the past, because they’re still an issue now even if they’re not making the big headlines in the current moment. How closely do you inspect what 3rd party plugins and libraries you use with software and development? We kind of tend to take for granted that once we vet a library or plugin and add that into our usage, then it’s likely to never be a threat in the future. However, over the last few years attackers have started increasing abuse of this trust. A type of watering hole attack that reaches a larger amount of people than a typical focused attack. This has affected a wide range of software, from web applications to web browsers to text editors/IDE’s. Let’s take a brief look at a few instances. WordPress Display-Widgets plugin. This plugin was sold by the original developer, and at that time had several hundred thousand active installations. The new developers then added code to it that downloaded and installed a plugin that added spam the site. The Node.js package repository was found to have malicious packages that looked like real packages, differing slightly in the name in an attempt to fool anyone trying to find specific packages. The malicious packages generally tried to send sensitive environment data back to a server. Python also experienced something very similar. Package uploaded in an attempt to fool anyone not paying close enough attention. Not relying on just misspelling the name, but with names that look legitimate, such as “bzip” for the real package “bzip2file”. Those are just a few examples, Chrome and Firefox have both had similar issues multiple times as well. So how do we protect against this? Partly some of this has to be on the software that allows the plugins to run. There are some bad policies and practices here, such as WordPress letting anyone claim “abandoned” plugins. Some things you can do yourself are to install any libraries/plugins (for python, ruby etc) with your systems package manager. If you use pip, gem or the like, make sure you are using the correct plugins, avoid misspellings or “close enough” names. Check the reputations of plugins via Twitter or search for reviews and info on plugins, by name, in your search engine. If you find any anomalies report them on social media and forums associated with your language. Try not to use plugins that have been abandoned and recovered by another developer with no reputation. MSI is proud to announce the immediate availability of the HoneyPoint Console version 4.1! The new version of the Console for HPSS is now available for Windows, Linux and Mac OS X. The new Console includes the ability to bypass local event logging and instead send the events directly to syslog or to be processed by the plugins. This allows the Console to work with a SIEM, other monitoring tools, or any centralized log management system without worrying about managing the local event database. Several improvements in the GUI console have been made, the ability to test email servers has been added, and multiple bugs have been addressed. To obtain the new Console files or installer, refer to your QuickStart Guide on how to access the HoneyPoint Security Server distribution site. No changes to the database or license key are required, however, you must have a current license to qualify for the upgrade. An in place upgrade can be performed or the installer can handle the upgrade on Windows. As always, we recommend backing up the database and any plugins and logs before upgrading. Thanks, as always, for choosing HoneyPoint Security Server and MSI. We value your partnership and trust. 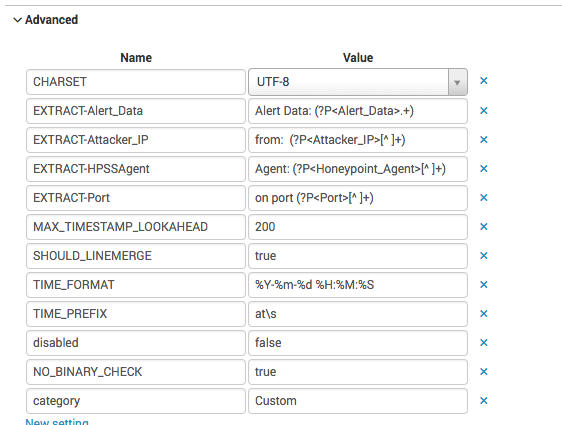 We’ve had a few users ask how to feed alerts from the HPSS Console into a SIEM. In these cases it was Splunk, so I will show how to quickly get a feed going into Splunk and some basic visualizations. I chose Splunk since that’s what I helped the users with, but any SIEM that will take syslog will work. The first step is to get the HPSS Console set up to externally log events. This can be enabled by checking the “Enable System Logging” in the preferences window. What happens with the output depends on your OS. On Windows the events are written to Event Log, and on Linux/MacOS they are handled by the syslog daemon. Alternatively you can use the Console plugins system if syslog/eventlog is not flexible enough. Before we go further, we’ll need to configure Splunk to read in the data, or even set up Splunk if you don’t have an existing system. For this blog post, I used the Splunk Docker image to get it up and running a couple minutes in a container. This tells Splunk how to extract the data from the event. You can also define this in the Splunk web interface by going to Settings -> Source Types and creating a new source type. Next create the Index under Settings -> Indexes. Just giving the index a name and leaving everything default will work fine to get started. To create a Data Input, go to Settings -> Data Inputs. I’m going to set it up to directly ingest the data through a TCP socket, but if you already have a setup to read files from a centralized logging system, then feel free to use that instead. Set the port and protocol to whatever you would like. For the source type, manually typing in “hpss” (or whatever you named it) should bring up the already defined source type. Select that, and everything else can remain as is. Then go to review and finish. It’s now ready for you to ship the events to it. Lastly, we need to get the logs from the Console system to Splunk. Again, this will differ depending on your OS. I will show one way to do this on Windows and one for Linux. However, there are numerous ways to do it. In both cases, replace the IP and Port of your Splunk instance. On Windows you can use NXLog or another type of eventlog to syslog shipper. After installing NXLog, edit the following into the configuration file. Now Splunk should be receiving any HPSS events sent to it and storing them in the defined index, and extracting the fields during search queries. In the future we can look at creating some graphs and analyze the events received. If there is any interest, I can look at creating a Splunk app to configure all of this for you. For this weeks tool review, we’re looking at Splunk. Splunk is a log collection engine at heart, but it’s really more than that. Think of it as search engine for your IT infrastructure. 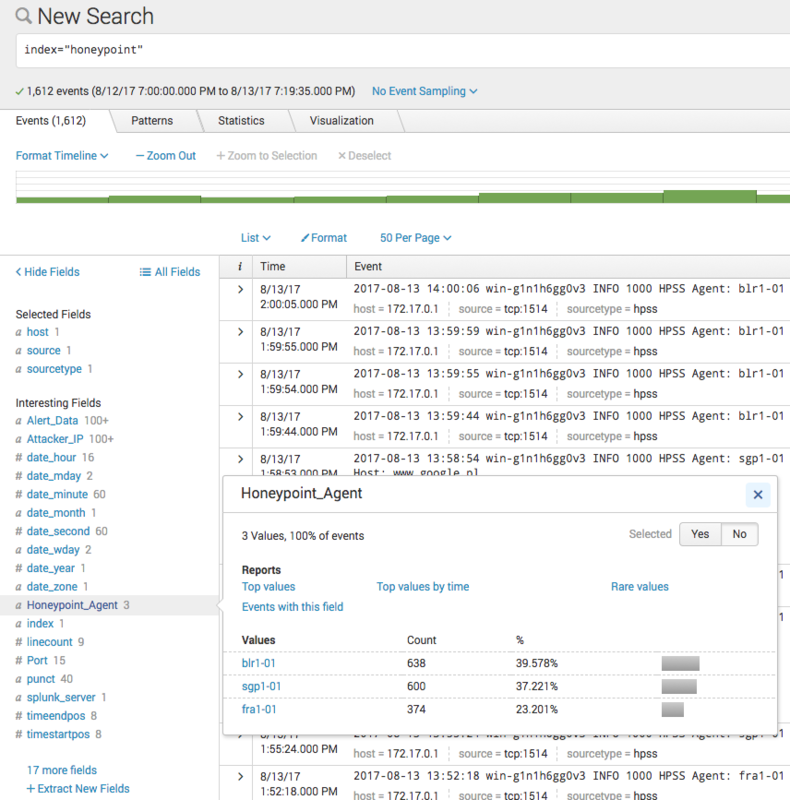 Splunk will actually collect and index anything you can throw at it, and this is what made me want to explore it. Setting up your Splunk server is easy, there’s installers for every major OS. Run the installer and visit the web front end, and you are in business. Set up any collection sources you need, I started off with syslog. I started a listener in Splunk, and then forwarded my sources to Splunk (I used syslog-ng for this). Splunk will also easily do WMI polling, monitoring local files, change monitoring, or run scripts to generate any data you want. Some data sources require running Splunk as an agent, but it goes easy on system resources as the GUI is turned off. Installing agents is exactly the same process — you just disable the GUI when you’re finished setting up; however you can still control Splunk through the command line. Splunk can also run addons, in the form of apps. These are plugins that are designed to take and display certain information. There are quite a few, provided both by the Splunk team and also some created by third parties. I found the system monitoring tools to be very helpful. There are scripts for both Windows and Unix. In this instance, it does require running clients on the system. There are also apps designed for Blue Coat, Cisco Security and more. In my time using Splunk, I’ve found it to be a great tool for watching logs for security issues (brute forcing ssh accounts for example), it was also useful in fine tuning my egress filtering, as I could instantly see what was being blocked by the firewall, and of course the system monitoring aspects are useful. It could find a home in any organization, and it plays nice with other tools or could happily be your main log aggregation system. Splunk comes in two flavors, free and professional. There’s not a great difference between them. The biggest difference is that with the free version Splunk is limited to 500MB of indexing per day, which proves to be more than enough for most small businesses, and testing for larger environments. Stepping up to the professional version is a lot easier on the pockets than might be expected, only about $3,000.